What does boffin, hooligan, leotard, nicotine, tarmac and wisteria have in common? Very little it would seem, except that they are all eponyms, words derived from a real, fictional or mythical persons. Most eponyms come from a person’s surname such as mackintosh from the Scottish chemist, Charles Mackintosh, or sandwich from John Montagu, the 4th Earl of Sandwich. Conversely, eponym also refers to the person from whom the word is derived. The word eponym comes from the Greek epi meaning ‘upon’, and onyma meaning ‘name’. There are thousands of eponyms in the English language. Many are so common that we don’t realise that they are eponyms, such as bigot after Nathaniel Bigot, an English Puritan teacher, diesel named after Rudolph Diesel, the German mechanical engineer, or teddy bear from the nickname for the USA president Theodore Roosevelt. And would you have any idea that Granny Smith apples are named after Marie Ana (Granny) Smith who in 1868 in Australia grew an apple from a chance seedling. The decibel, commonly used as a measure of sound levels, is ten times the power of a bel. 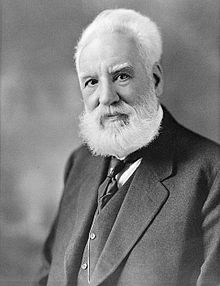 The bel was named after Alexander Graham Bell (1847-1922), the Scottish-born scientist and engineer who invented the telephone. People who discover or invent things are a major source of eponyms, and a large number of astronomical objects (eg. Barnard’s star, Halley’s comet), chemical elements (eg. Curium, Titanium), diseases (eg. Huntington’s disease, Münchausen syndrome), mathematical theorems (eg. Fibonacci sequence, Pythagorean theorem), minerals (eg. Fergusonite, Herbertsmithite), and scientific laws and phenomena (eg. Avogadro’s number, Heisenberg uncertainty principle, Newton’s laws of motion, Richter scale), are eponymic. And there are proprietary names that have become eponyms, though some would say they are not eponyms, just brand names that have come into general use. Some are still actively trademarked, the use of which manufacturers try to protect, whilst others are now defunct. Aspirin, blu-tack, coke (as in Coca Cola), escalator, filofax, frisbee, granola, heroin, highlighter, hula-hoop, ketchup, jacuzzi, jeep, pogo stick, post-it note, sellotape, shredded wheat, teflon, thermos, valium, velcro and zipper are eponyms in common use, though alka seltzer, brillo pad, celluloid, dettol, kleenex, linoleum, nescaf, polaroid, roladex, tippex, tupperware, walkman and xerox are now less well-known. Biro and hoover are eponyms in the United Kingdom for pens and vacuum cleaners respectively, but not apparently in the United States. The garibaldi biscuit was named after Italian patriot, general and politician Giuseppe Garibaldi (1807-1882), known as one of the founding fathers of Italy. It was invented by Carlisle biscuit-maker Jonathan Carr working for the Peek Freans biscuit company in Bermondsey, London, in 1861, the year the Kingdom of Italy was proclaimed. Spam, a product and trademark of Hormel Foods in the USA introduced in 1937, was originally used eponymously to refer to any brand of canned chopped pork and ham. It became part of folklore and humour through a Monty Python sketch in 1970, in which spam was portrayed as ubiquitous and inescapable. With the coming of email, spam was the ideal name for the unsolicited commercial messages that were sent indiscriminately to millions of people. Eponymous is the adjective and there are hundreds of eponymous adjectives in the English language such as herculean from Hercules of Greek mythology, machiavellian from Niccolò Machiavelli, or sadistic from Marquis de Sade. British monarchs have given their name to eponymous adjectives of time periods or fashions such Elizabethan, Georgian, Victorian or Edwardian.